Explain and contrast relevant ethical theories. Identify ethical issues in a complex context. While the Pathways curriculum does not currently apply to the department’s professional writing courses, it sets forth some reasonable goals for ethical reasoning that can help prepare students for writing in the workplace. 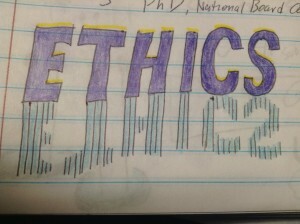 After attending the Pathways Summer Seminar in June, I realized that there were some simple ways to incorporate discussions of ethical reasoning into the things that I was already doing in the classroom. Here are four resources that I developed these materials to use as I talk about ethics in my classes. This activity asks students to look at the codes of ethics for professional writing associations and then to examine the codes for their own field, looking for places that those codes discuss ethics and communication. This discussion strategy asks students to choose among eight options as they consider ethical scenarios related to technical and business writing. The technique deepens the class conversation by adding more nuanced options than a polar choice of ethical or not. Used with the discussion strategy in the previous post, this collection of ten scenarios gives students situations from the workplace that challenge them to use their ethical reasoning skills. Connect these scenarios to the first activity by asking students to explain how their code of ethics relates to the choices that they make. This more complex discussion activity asks students to think though the ethical positions as they relate to a specific workplace situation. Specifically, the activity asks students to consider how Microsoft ignored focus group responses to the Clippy, the virtual assistant that was once a part of the Microsoft Office suite. In the past, I have discussed ethics once, covering most issues broadly and dealing with the ethics of intellectual property rights in more detail. With these new activities, I plan to make discussion of ethics part of every major project in the course. In the end, I think students will be better prepared with the complicated situations that they will face in the workplace.